Ever since the early days of the AFL, the Chiefs and the Denver Broncos have been in a heated rivalry. Curiously, the Broncos and the Chiefs have only met in the playoffs once in the entire history of the league. They met in 1998 in the AFC Divisional Playoffs and the Broncos were the victor winning 14 to 10. This was back in the day when the Chiefs were a passing team, and the Chiefs running game only generated 77 yards. Broncos running back Terrell Davis controlled the ground game with 101 yards while Mr. John Elway himself got the job done throwing the ball. The Denver Broncos would go on to win the Superbowl that year. The most humorous thing about the Broncos - Chiefs rivalry was back in the 90's watching John Elway run for his life from Derrick Thomas and Neil Smith. Elway would come out looking like a package ready to be shipped via FedEx, full HUGE chest and back padding, wrapped up like a stuffed doll, running (very slowly) away from the waiting arms of a Derrick Thomas or a Neil Smith. 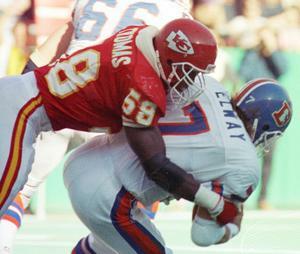 Watching Elway get sacked was the highlite of every Chiefs / Broncos match up back in those days.